Dry and damaged hair is caused by moisture loss because it is often colored or often uses tools and products for hot hair such as hair dryers and curves. As we get older, hair also tends to become more rough and brittle, so it's no wonder our hair feels dry, brittle and also damaged. Perform the following steps to protect and restore the natural moisture of your hair without having to bother to salon and costs are expensive. 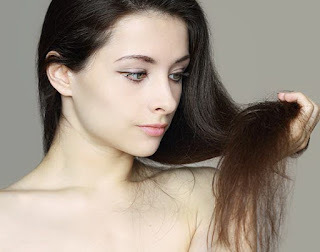 If the hair is dry and brittle, special attention is needed to the ingredients in the hair products used. You need to use products that contain ingredients such as shea butter, olive oil, argan oil, or coconut oil, which are proven to increase hydration, not only in the hair, but also in the skin. Two ingredients that you want to avoid in your product are silicon and alcohol. Silicon can create a barrier to the hair and will prevent the hair to absorb moisture that it needs. While alcohol will really make your hair ' dehydrated ' or dry. A material that contains sulfates dry nature and also can make the hair becomes drier. Try shampoo with organic materials or materials with a more natural and safe for the hair. Try not to wash your hair every day. Do it once every two days to retain the natural oils in the hair. If you have oil in the scalp that you can't hold it, try using a dry shampoo to deal with this problem, because usually that oily skin is just his head only. Spray dry shampoo 10-20 cm from head to prevent product buildup. When you are using the shampoo, wipe at the root of the hair, because all the oil is concentrated there. So you can simply use a conditioner on the ends of the hair and avoid the roots of the hair, as the hair roots can be greasy. To soften coarse hair and add moisture, use a hair mask at least once a week. Apply the mask to your hair, flatten the mask to the rest of the hair and leave on for 20 to 30 minutes before rinsing. You can also create your own hair mask with natural ingredients. Hair styling tools that heat and rays of the Sun can be the cause of the most important in terms of damage to the hair. Protect your hair by wearing a hat when you are outside. In addition, before using hair styling tools, recommended always use a heat protector for the hair to prevent damage. You should also make sure her hair is 100% dry before using hair styling tools. Do not use hair styling tools too often. Either you're coloring hair for covering grey hair or add highlights; the chemical process could damage the hair. It is recommended always do treatment before coloring hair. When your hair is dyed using hair dye, you open the cuticle, which can cause damage. To keep the hair stay healthy and moisturized post-treatment, use a moisturizing product such as hair mask hair at home first. If your hair is damaged has a texture like hay, the first thing you can do to restore it and make it look better is to cut the ends of the hair that is damaged or even branched. If you are brave enough to cut everything, pixie or bob hairstyle can be the right one. If cutting hair to short you think is too extreme, cut the ends of the hair with the layer is probably the easier way, but this should be followed by a regimen of health care for damaged hair, including the use of shampoos, products conditioner, and hair masks. Hair is most likely to be damaged at the end of it because it was the longest to grow and have more time to be affected by many of the elements that cause damage. Maintaining the health of the body as a whole can help damaged hair to be healthy along with parts of your body. Like the rest of your body, your hair is affected by what you eat and drink. Be sure to consume plenty of water, vitamins and nutrients. Foods like meat without fat and other proteins, vegetables, fruit and low-fat dairy can help keep hair healthy. Omega-3 fatty acids are good for your hair and skin, and can be found on the salmon. Fruits and vegetables such as spinach, kale, carrots and avocados can also raise hair health. The ways to treat dry and damaged hair above can help you to get a good hair day every day that is healthy, beautiful and shiny. What are you waiting for? Try doing it now.